The table called tblCard whose CardTitle and Description fields we'll display. There is no shame - quite the opposite, in fact - in copying and pasting your code-behind to populate the data table of cards. You can then set the ItemsSource of the datagrid to bind to this table. The new version of the datagrid includes two columns only. 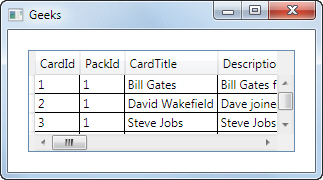 Set the CanUserSortColumns property of the DataGrid and the SortMemberPath of each column so that sorting works (you could also set the SortDirection property of the card title column so that initially the geeks are sorted by their card title). Set a row background and alternating row background for the datagrid. Set suitable widths for each column. You can see the effect of these changes on the next page. The datagrid with the above changes applied. What you would see if you were to double-click on Steve Jobs.